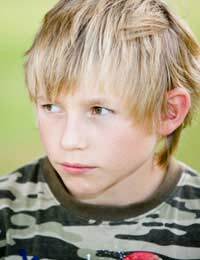 Unfortunately a speech difficulty or speech disorder often marks a child out for bullying. For example, children who stammer or stutter often have to cope with bullies making fun of the way they speak, having bullies call them dumb, and even having well meaning friends jump in to finish their sentences. Bullying can make going to school, sports practice, or even simply out to the local shopping centre a living nightmare for many children, but there are ways of dealing with this nasty behaviour. Bullying occurs when an individual consistently and consciously harasses another. Bullies know full well what they are doing is wrong, and that they will be punished for such behaviour if caught, but continue to do it anyway. Name calling, insulting others, “teasing” others, hitting, kicking, punching, pinching, pushing, hair pulling and/or spitting on others are all bullying behaviours. Stealing, hiding, defacing or breaking someone else’s possessions, spreading rumours about another person, shouting at or about another person and/or singling someone out to be excluded or ignored are also bullying behaviours. Bullying can also be carried out via electronic means, such as sending offensive or harmful emails, text messages or instant messages, and/or posting hurtful information, rumours or pictures of another individual on a website or ‘blog. Bullying is a hurtful, harmful activity but there are ways of dealing with a bully. If the bullying takes place at school, a student can ask to see a copy of the school’s anti-bullying policy. Instances of bullying should be recorded in a diary, including what happened and who was involved. Children should tell a trusted adult about what is happening and save proof, such as nasty text messages or defaced possessions, in case it is needed as evidence later. Those being bullied should not reply to technological abuse, such as via email or text message, but should keep print-outs of these nasty communications. Those being bullied should also try to stay around other people as bullies often seek out victims who are alone. When ready, those being bullied should make a formal complaint to their school but should not attempt to stand up to bullies alone. This may just bring on further bullying and put them in physical danger. Those being bullied should also take care not to become bullies themselves. Sometimes victims of bullying become so frustrated with the way they are being treated that they take it out on someone else. This just perpetuates a cycle of bullying and hurts even more people. Parents of children who are being bullied can help their children prepare for interactions with the bully. Working out a plan of what children will do if a bully approaches, or what they will say if they must interact with the bully, can help children feel more prepared. Parents of children who have a speech difficulty that is worsened by stress can also remind children of how to relax and help them practice speech activities to avoid a flare-up of their speech difficulty. Parents should not advise children to simply ignore the bully. Not only do bullies need to know that what they are doing is wrong, but ignoring his or her hurtful words and actions means that the child still must endure them. Parents should also not advise children to fight back as this potentially puts all of the children involved in physical danger and also sends the message that fighting is acceptable. Children in mainstream education who must cope with a speech difficulty or disorder are often the subject of curiosity from other students. Teachers should take the time to discuss students’ speech difficulties in class and answer any questions that students may have. Inviting the child’s parent in to help with this question and answer session may be useful. By addressing the speech difficulty from the start, teachers send the message that there is nothing odd about it, it is simply something that the student lives with. If students will be leaving a class to go to speech therapy, teachers may also take the time to introduce the speech therapist to the class and explain why the student is leaving. Once the mystery surrounding a topic is gone, students generally lose interest as it is simply a normal part of their lives.